Persada Johor’s main Convention Hall (3,078 sq.m.) has a highly modular floor layout that can be easily converted into three smaller fully soundproofed Convention Halls: Hall 301 (1,058 sq.m.) with a maximum capacity of 1,000 persons; Hall 302 (902 sq.m.) with a maximum capacity of 900 persons; and Hall 303 (903 sq.m.) with a maximum capacity of 900 persons. All Convention Hall capacities stated are in theatre-style but fully convertible to reception, classroom and banquet arrangements. 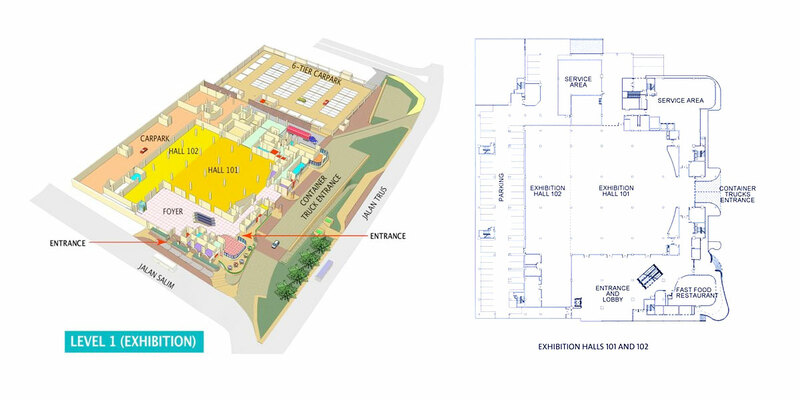 Exhibition Hall comprises two separate halls that can be combined to offer a total floor space of 3,070 sq m (33,051 sq ft), which can be used for exhibitions, conventions, banquets, concerts, trade shows and sporting events. Exhibition Hall 101 (1,931 sq m) is able to accommodate 100 booths of 3m x 3m stands with a ceiling height of 9 metres, while Exhibition Hall 102 (1,140 sq m) can accommodate 50 booths with a limited ceiling height of 4.5 metres. 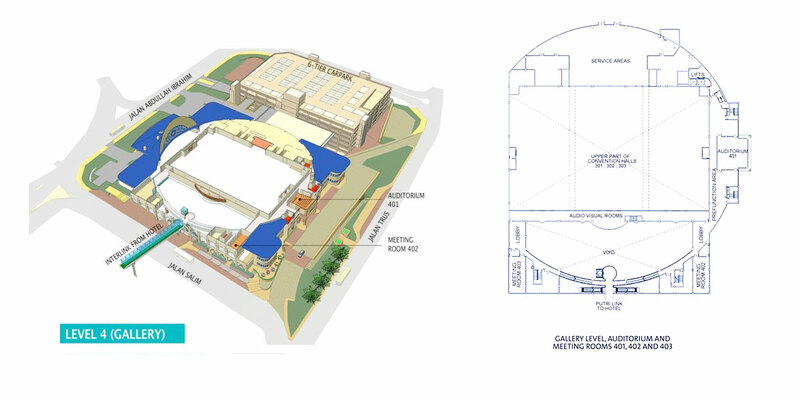 At the Gallery Level (Level 4), there are one meeting rooms, an auditorium (401) with a nonflexible seating capacity of 84 persons. 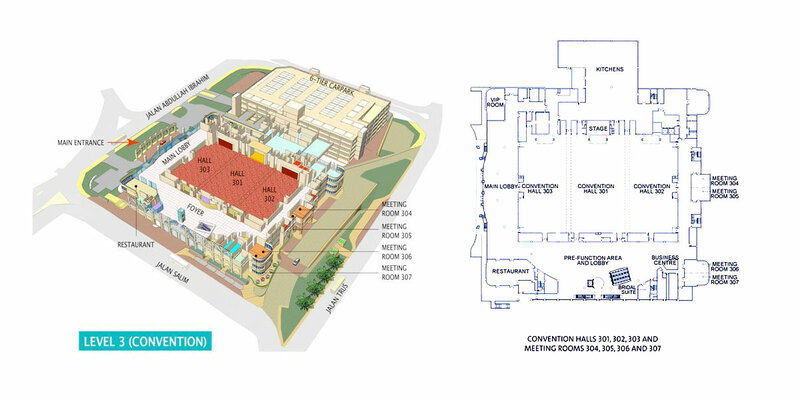 At the Convention Hall Level (Level 3), there are four meeting rooms: Room 304 (60 persons), Room 305 (60 persons), Room 306 (120 persons). All Meeting Room capacities stated are in theatrestyle arrangement but fully convertible to reception, classroom and banquet arrangements. The Selasih Malay Restaurant is just about the only place in Johor Bahru offering up market Malay-style dining. There’s deliciously authentic Johorean cuisine and all day dining, either from the a la carte menu or its tantalizing buffets. Open daily from 7.00am to 10.30pm. A fast-food restaurant to cater to family dining and the specific needs of children. A selection of mobile restaurants that come looking for you. The mobile restaurants are unique features at Persada Johor, serving fresh, hot and chilled food, as well as snack items in mobile units. Hot drinks are also ready to be served.